The link below takes you to Castle Siege Alliance Forum....This includes information on Alliances, Alliance Chat pages & Alliance Recruitment threads. Alliances can help you a great deal with game information, tips & tricks...and Wonder Boosts. If you are new to the game and have ANY questions you want to ask...feel free to post them below, there are many players in this forum willing to help you with your game. REMEMBER don't be embarrassed to ask, we will do our best to help you. * Walls -- Make sure all walls are closed or connected -- angles don't work unless they are double layers.........if your walls are NOT connected or open spots.....attackers can spawn troops inside your layout....if there are gaps in walls, troops can squeeze through these. Don't use emplacements as walls or farms and such........troops can walk right past these and it leaves your walls unconnected. * Protect your most valuable buildings -- percentage wise -- If someone takes 50% of your layout.....they win with one star. So try not to leave 50% of your resources on the lawn. Castle, Storage, Production & Church and School......have a greater % value than military buildings. Exp - Don't protect your siege workshop and then leave your stone house on the lawn........siege work shop is worth very little. * Army camps disappear when someone attacks you, but they do leave an imprint on the ground.....so don't place them inside the walls or against your outer walls. The imprint will show others where there are no traps and it is safe to attack there. * Do protect your GH = Guard Houses -- as they regenerate troops when they are killed....there is a timer above the GH to show when new troops will be deployed. * Don't place archers or grens on top of your gates.......they will die if a ram or trebs takes that gate down. Always check after aging up or doing research on walls - that you are using ALL of your wall troops......many forget to replace them after changing layouts. * Martel - Remember splash damage when using Martel -- if he is close to your trebs while HE is being attacked...the splash damage will kill your trebs or other siege near him. *Martel - when using him, don't place him right next to a cannon or emplacement as they can't shoot at him that close so they will retarget your trebs or troops. *Belisarius - When using him to take down walls - Place a troop or blues on the wall you want to target to act as a shield - then ZOOM in where the walls you want to undermine (destroy) is right under his ability shield and you won't have to move his ability button so far to target a wall......this really works. * Edward - in higher ages it is easier to use Edward if you send troops to the keep before him to take the damage.....Knights Templars work well for this. Edward at lvl 1 can only take down age 7 and younger castles (you will need something else to finish off the castle if age 8 or older) -- he must be level 2 to take down castles age 8 and above by himself. At this time he still need some protection in order to keep him alive to use all 3 abilities. * Trebs - ALWAYS drops & place meat (champs, blues - cheaper troops) Before dropping your trebs....keep them in front and replace them when they all start to die. Also have a MaM or Calvary troop on the ground or be ready to drop them the instant engineer traps spring up or you will loose your trebs. * Conrad - When using Conrad.......try to not let him park on the outside walls........he is a great distraction for all defense to fire at and flame towers.....so when he is deployed......hit his ability before he docks to a wall or you can't use his ability -- you can hold him back from docking if you grab him like you are moving a troop..........hold him until walls are down and you can direct him farther inside the castle walls. * Conrad adds a speed and defense boost to ALL siege within his ability range -- so if you are using rams and trebs......if you drop them all near him before you activate him -- he will boost them also (protect them). You must click his ability before he docks on a wall or there will be no ability. * Joan - If you take Joan - don't destroy the WS and the GH's -- as you will have no extra troops to convert. Some even set off the Watch Signal on purpose so they will have more troops to convert. * While scouting for a castle to attack, look at their embassy - if it has no shield, there will be no Troops coming out of the Watch Signal -- this is good, there is also a slimmer chance of being revenged. *** There are several great videos listed in this thread on attacking tips and tricks and hero usage by @lilanthe -- scroll through the thread to find them, they are well worth watching. Nothing will improve your game more than an alliance. Plus it's way more fun to compete in alliance leagues. Whatever alliance you join/create will have admirers and detractors, they are all right, as are you, whatever works for you is ok. Play by and within the rules then there is no right or wrong Alliance. An alliance full of inactive members will not help you. It's important to only join an active alliance. You can check that before joining. In the alliance list, press the yellow right arrow until the alliance is sorted by last log in date. Make sure most members logged in within the past few days. I agree - and I would look at troop donations too. Hi ! I am not a new player but I have a question about this forum ! How I can post a photos on a topic Please say me ! 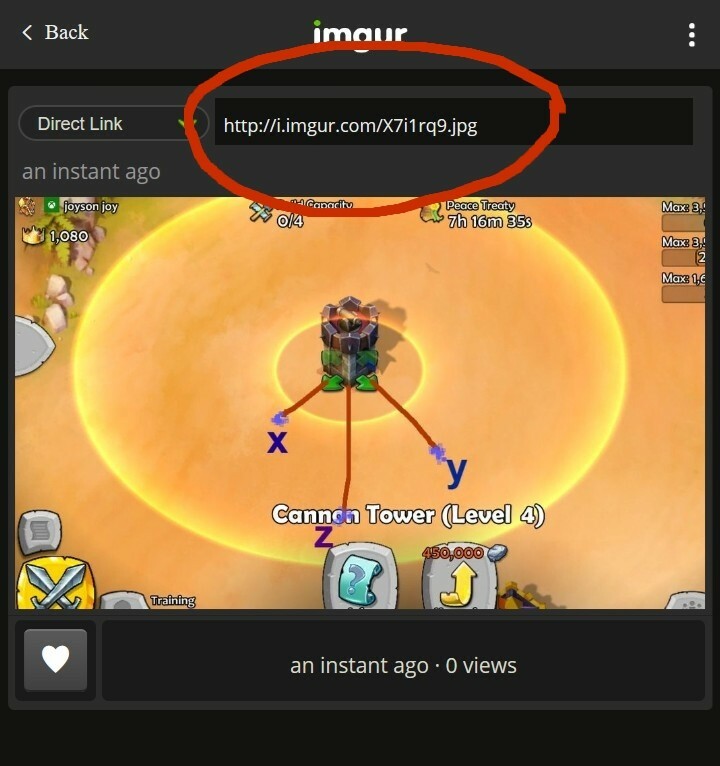 Upload to image sharing site such as imgur..
Share your tips and tricks in this thread to help others get to Age 10! - Engineer Traps can be placed on roads. You can use this to help protect your Empire! - Knights Templar are better at destroying walls and towers than Cavalry. -Complete civilization objectives to help build your skill and get gold! - Decorations can be placed on Flame Traps to hide them. Experiment with these to trick your enemies! -Join the forum, our twitter page, or Facebook to get advice from other players! - Keep area of effect defenses, such as Crossbow and Flame Towers, close to emplacements to better defend against ladder men and cavalry. - While scouting an attack, look out for Guard Houses and the Watch Signal; these should be priority targets when planning an attack. For good defence use ur troops as "hold ur position " ... So that joan of arc.. Can't use all of ur troops against u..!! It is better to set Guard Houses to "Agressive" stance and Patrol Points to "Hold ground" stance. First because Joan isn't used so often, and second, because Guard Houses are almost useless while in "Hold ground" stance.